Please find here the IHRA definition translated in all EU languages. Declaration on Antisemitism and security of Jewish communities and institutions, adopted by the the Justice and Home Affairs Council on 6 December 2018 (press release). On 10 December 2018, the Fundamental Rights Agency – upon request of the Commission - published the largest survey ever held among European Jews on their perception and experience of Antisemitism. The Holocaust is a defining legacy of European History and remembrance of the Shoah an important instrument in the prevention of Antisemitism. The European Commission commemorates every year on 27 January the International Holocaust Remembrance Day with training for EU officials, exhibitions and dedicated events. Please find the events of Holocaust Remembrance Day 2017 here. Under the Europe for Citizens Programme, the European Commission supports initiatives that raise awareness of remembrance, common history and values of the European Union and to commemorate the victims with 35 million €. Following the terrorist attacks in Paris and Copenhagen, EU Education Ministers adopted on 17 March 2015 the Paris Declaration on Promoting citizenship and the common values of freedom, tolerance and non-discrimination through education. Jewish life has always been an integral part of European society, history and culture. Including a more holistic approach in education on Jewish History and Jewish contribution to Europe can help to prevent negative stereotypes and bias against Jews and build up solid resilience against Antisemitism in society. The European Commission supports civil society to “teach the teachers” to address their own biases, and equip them for teaching about Judaism in a multicultural class room. On 14 June 2016, the Commission set out a number of initiatives to support Member States in their efforts across several policy areas, from promoting inclusive education and common values, to tackling extremist propaganda online and radicalisation in prisons. 400 million € Erasmus+ funding support transnational projects promoting social inclusion, our shared values and intercultural understanding and further 13 million € grassroots initiatives, including education targeting specific groups and their biases. In June 2016, the European Commission adopted an action plan to improve the integration of newcomers in European societies. Integration is a two-way process which includes expectations towards newcomers to embrace EU fundamental values, including no tolerance towards Antisemitism. Holocaust denial and antisemitic hate speech inciting to violence and hatred is outlawed in Europe. The aim of the Framework Decision on combating racism and xenophobia (2008) is to fight against illegal hate speech and crime, by means of criminal law. The Commission is committed to monitoring closely its implementation at the national level. EU countries were obliged to transpose the Framework Decision into their national laws by 28 November 2010. The Commission published its first implementation report in January 2014 together with an Annex summarising national transposition measures and data on application of the Framework Decision submitted by the Member States. In order to fight illegal hate speech online, including antisemitic hate speech, the Commission together with major IT Companies agreed on 31 May 2016 on a code of conduct. The code establishes among others that IT companies will review the majority of valid notifications for removal of illegal hate speech in less than 24 hours and remove or disable access to such content, if necessary. Progress is regularly reported back to the High Level group on combating racism, xenophobia and other forms of intolerance. On 6 December 2016 the European Commission published the first implementation report. The second implementation report was released on 1st June 2017. On 14 June 2016, the European Commission launched the High Level Group on combating Racism, Xenophobia and other forms of Intolerance to step up cooperation and coordination, to better prevent and combat hate crime and hate speech. It brings together all 28 EU Member States, international organisations and civil society organisations. The Commission asked the EU Fundamental Rights Agency to coordinate a Sub-group that will work to develop methodologies for recording and collecting data on hate crime. The EU-Israel seminar is a unique annual forum that brings together European and Israeli civil servants, policymakers, companies, international organisations and civil society to discuss best practices and ways forward in addressing racism, xenophobia and antisemitism. The seminar took place in Brussels on 17 December 2018. 22 January 2019, Jewish Museum of Belgium: ahead of the International Holocaust Remembrance Day on 27 January 2019, the Director of the Jewish Museum of Belgium, Ms Pascale Falek Alhadeff, and the European Commissioner for Justice, Consumers and Gender Equality, Věra Jourová, launched the results of the Eurobarometer survey on the perceptions of Antisemitism among the general public in the 28 EU countries. This survey was carried out among 27,643 respondents across Europe. Commissioner Věra Jourová spoke about recent policy developments and shared her thoughts on future initiatives to counter Antisemitism to ensure that the Council declaration on Antisemitism of 6 December 2018, will not remain an empty shell. A Q&A presenting all the Commission actions is available here. 15 January 2019: President Juncker firmly spoke against Antisemitism in European Parliament Plenary. Message (FR, DE, HE) by Frans Timmermans, First Vice-President of the European Commission on the occasion of the Jewish New Year (Rosh Hashanah). 8 June 2018: EC Coordinator on combating Antisemitism features in new Online Course by Yad Vashem on "Antisemitism: From Its Origins to the Present". Please find the MOOC for free here. 23 May 2018: First Vice-President FransTimmermans receives the Lord Jakobovits Prize for European Jewry at the Great Synagogue in Brussels Read the speech. 19 May 2018: Antisemitism in the spotlight - Interview by Politico's Ryan Heath with EC Coordinator on combating Antisemitism Katharina von Schnurbein. Listen here to the podcast. 8 May 2018: Speech by First Vice-President FransTimmermans on Memorial service at the Forum der Joodse Organisaties in Antwerp. 23-24 April 2018: "Addressing Rising Antisemitism in Europe“, Policy workshop organized at the European University Institute in Florence. 26 April 2018: EC Coordinator on combating Antisemitism, Katharina von Schnurbein, was awarded the B'nai B'rith Europe Human Rights Prize 2018, Mémorial de la Shoah, Paris. 10 April 2018: Launch of the Jewish Policy Research Institute report on 'European Jewish identity: mosaic or monolith?' at the European Commission. 30 January 2018: 5th Annual training on Holocaust Remembrance and Fundamental Rights for EU officials with the Memorial Site 'House of the Wannsee-conference'. Speech (IT version), held by the Coordinator on combating Antisemitism on 26th January at the Mandela Forum in Florence, to 8000 students from across Tuscany on the occasion of the Holocaust Remembrance Day 2018. Brussels, 24 January 2018: avant-premiére of the documentary "Nana", followed by a debate between First Vice-President Frans Timmermans, Professor Simon Schama and movie director Serena Dykman. Wishing the Jewish community a Happy Chanukah! Chanukah sameach! The Commission is holding the annual EuroChanukah in cooperation with the European Jewish Community Centre on 19th December under the patronage of Commissioner Pierre Moscovici. 30 October 2017: Commissioner Věra Jourová speaking at the B’nai B’rith conference "Jewish Communities and Western Democracies: What Is the Future? ", Prague. On Yom Kippur, 30 September, First Vice-President Frans Timmermans met with the Latvian-Jewish community and visited the memorial to the Righteous among the Nations Zanis Lipke in Riga. Message (FR, DE) from First Vice-President Frans Timmermans to the Jewish Community in Europe, on the occasion of Rosh-Hashana, 20 September 2017. Listen to a podcast interview from Daniel S. Mariaschin, CEO of B'nai B'rith International, to Katharina von Schnurbein. Commissioner for Justice, Consumers and Gender Equality Vera Jourová spoke at the 11th EU - Israel seminar on combating Racism, Xenophobia and Antisemitism, Jerusalem, 25 June 2017. On 30 May 2017, the European Commission, the European Parliament Anti-Racism and Diversity Group, the OSCE Office for Democratic Institutions and Human Rights, the European External Action Service, organised a Joint Day of Action against Antisemitism, anti-Muslim hatred and discrimination. Among the events, the public presentation of OSCE/ODIHR’s new publication: “Understanding Anti-Semitic Hate Crimes and Addressing the Security Needs of Jewish Communities – a Practical Guide” and a joint Shavuot and Iftar dinner. Commissioner for Justice, Consumers and Gender Equality Vera Jourová addressing the European Parliament on the Resolution on Combating Antisemitism, 31 May 2017. The EC Coordinator on Combating Antisemitism spoke at the Seminar on Combating Antisemitic Hate Speech (organised by the Council of Europe - No Hate Speech Movement Youth Campaign ) in Strasbourg, 10 May 2017. Link to the European Commission's web page dedicated to combating hate speech online. Speaking at the 60th anniversary of the Conference of European Rabbis, Amsterdam, 8 May 2017. The EC Coordinator on Combating Antisemitism met the Jewish Community of Thessaloniki on 3-4 May 2017. In the picture: the the Holocaust Memorial in the centre of the city. Meeting Ronald S. Lauder, President of the World Jewish Congress. Speaking at the 15th Plenary Assembly of the World Jewish Congress, New York City, 23-25 April 2017. Discussing Antisemitism in Poland with eminent experts and Holocaust survivor Marian Turski 27-30 March 2017. In the middle of society: Maccabi Germany opening its offices in Frankfurt in the Premises of the German Sports Association, Frankfurt 17 March 2017. Joining the Delegation of the International Holocaust Remembrance Alliance in meetings with Bulgarian authorities and the Jewish Community of Sofia 8-10 March 2017. Katharina von Schnurbein, EC Coordinator on Combating Antisemitism, and Gabriella Battaini-Dragoni, Deputy Director-General of the Council of Europe, 14 February 2017, Strasbourg. The EC Coordinator visited the Council of Europe on 14-15 February 2017 to strengthen the cooperation in the fight against Antisemitism. Commissioner for European Neighbourhood Policy & Enlargement Johannes Hahn and the European Commission Representation in Austria participated in the #WeRemember Campaign. 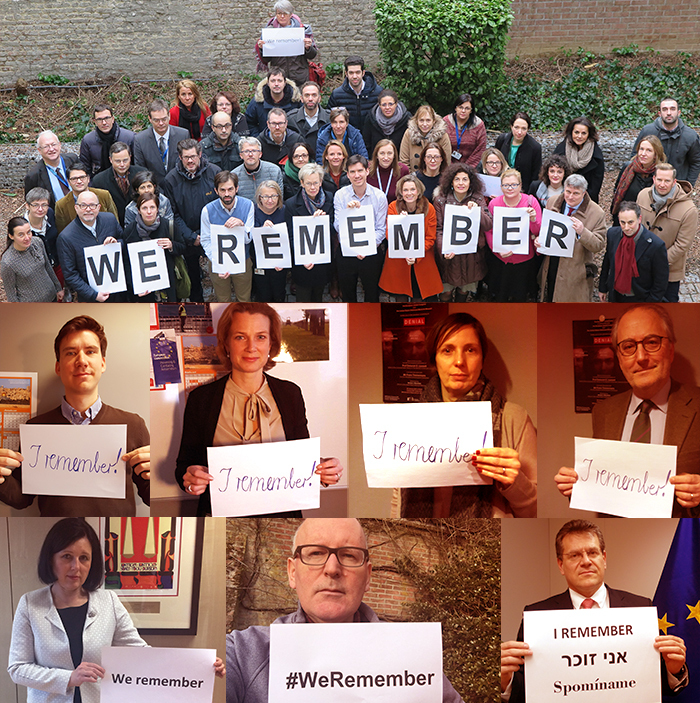 The European Commission staff supported the #WeRemember campaign launched by the World Jewish Congress. Speech ( video recording) by Věra Jourová, Commissioner for Justice, Consumers and Gender Equality, at the opening of an exhibition by Mémorial de la Shoah on Auschwitz-Birkenau in the Berlaymont, European Commission Headquarters, 30 January 2017. Please see the picture gallery. Please find here a message by European Commission President Jean-Claude Juncker to mark the International Holocaust Remembrance Day 2017. Full house at a debate with Professor Deborah Lipstadt and First Vice-President Frans Timmermans following the screening of the film "Denial", 26 January 2017. Commissioner Věra Jourová speaks at the occasion of the International Holocaust Remembrance Day 2017. EU Commission Coordinator on combating Antisemitism Katharina von Schnurbein in a TV discussion from the European Parliament premises on Holocaust Remembrance and the fight against Antisemitism. Watch the debate here. Speech of Frans Timmermans, First Vice-President of the European Commission, at the Inauguration of Rabbi Cohen, Maastricht, 22 January 2017. Joint Statement on the occasion of the 10th EU - Israel Seminar on Combating Racism, Xenophobia and Antisemitism, 13 and 14 December 2016, Jerusalem. Message (50 kB) from First Vice-President Frans Timmermans to the Jewish Community in Europe, on the occasion of Rosh-Hashana, 30 September 2016. The European Commission organised on 27 January 2016 several actions to commemorate the Holocaust: in particular, a training seminar for officials from all EU institutions focused on Fundamental Rights and Holocaust remembrance, closed by Věra Jourová, Commissioner for Justice, Consumers and Gender Equality. On the occasion of Holocaust Remembrance Day 2016, the Permament Delegation of the European Union to the Office of the United Nations in Geneva organised - among other initiatives - a photo exhibition named "The Family Camp ", in collaboration with the Permanent Missions of the Czech Republic and Poland and curated by the Terezin Memorial Museum. Message by President Jean-Claude Juncker (43 kB) to the Jewish community on the occasion of Holocaust Remembrance Day 2016. The European Commission appoints Ms Katharina von Schnurbein as Coordinator on combating antisemitism, 1 December 2015. Discrimination and hate crime against Jews in EU Member States: experiences and perceptions of antisemitism, November 2013. This FRA survey is the first-ever to collect comparable data on Jewish people’s experiences and perceptions of antisemitism, hate-motivated crime and discrimination across a number of EU Member States, specifically in Belgium, France, Germany, Hungary, Italy, Latvia, Sweden and the United Kingdom. Its findings reveal a worrying level of discrimination, particularly in employment and education, a widespread fear of victimisation and heightening concern about antisemitism online.